Here are the selective and important World History Questions and answers for all competitive exams. 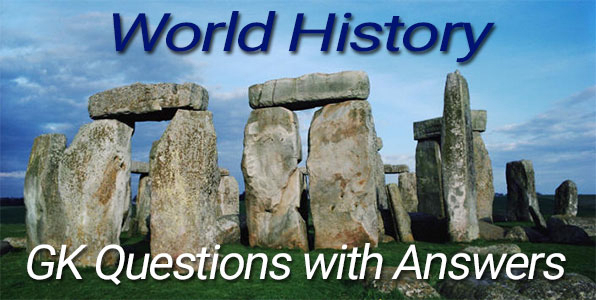 Practice with these world history GK and General Knowledge questions with answers. These world history GK questions have been asked in competitive exams and there are chances to ask again in competitive exams. So these world history questions are for your practice. This blog is also related to Basic GK Questions and Answers. As well as you can more practice by visit on History GK Questions and Answers. Q.1 Rivers Tigris and Euphrates are associated with? Q.2 Which is considered as the oldest civilization of the world? Q.3 Which among following is called "Gift of the Nile”? Q.4 Who is considered as the master of Greek comedy? Q.5 When ancient Olympic games first held? Q.6 Who is known as the father of Modern Medicine? Q.7 Who is known as the father of Modern Medicine? Q.8 Which was not a Roman Philosopher? Q.9 Who was among the famous Roman poets?